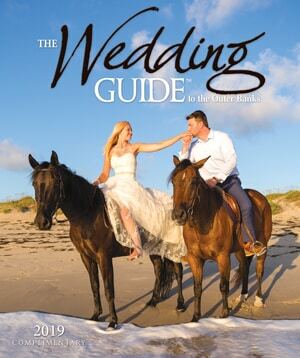 Where Luxury meets Convince, Haven on the Banks is an all-inclusive wedding venue in Nags Head. Our 6 cottages will host 60 guests, allowing for privacy while being close to each other! Also on-premise is our event center, Keeper’s Galley. Each of our 6 standalone cottages comfortably sleeps 10 and are fully equipped with incredible amenities to provide a unique, memorable experience. Our beautifully landscaped property also boasts a large pool, hot tub, tiki bar and cozy fire pit to further enhance your stay! Located a short stroll to Nags Head beautiful beach access. Keeper’s Galley event venue can host 180 guests with ample parking. This spacious 2,275 sq. ft. state-of-the-art open event area is climate controlled for year-round comfort. Upstairs bridal suite with lounge area and upscale bathroom along with groomsmen dressing room with bathroom allows the wedding party their own space to prepare for your wedding. The staircase and captain’s watch are designed for your keepsake photos. Fully equipped Caterer’s Kitchen has a convenient service entrance for staff.